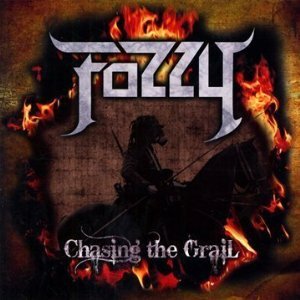 Fozzy's fourth album Chasing the Grail was unleashed upon fans this week after nearly five years of anticipating new and original material from the band. It was released by the Australian label Riot Entertainment. This hard and heavy hitting record lives up to, and even surpasses, Fozzy's 2005 release (and 2008 re-release) All That Remains. The lead single, "Martyr No More," is gaining airplay on hard rock radio, and it is also one of the official theme songs for World Wrestling Entertainment's 2010 Royal Rumble Pay-Per-View. "Martyr No More" opens with a fierce guitar riff from the very talented Rich Ward. The song has memorable verses, and an even more memorable chorus. The vocals, performed by none other than WWE Superstar and TV Host Chris Jericho, is sure to blow any rock fan away. The album's opening track "Under Blackened Skies" begins with machine gun fire-like intensity. The guitar, drums, and bass are all mighty powerful. The vocals, especially at the start of the verses, add a certain dark and hazy mood to the song. "Under Blackened Skies" was a great choice for an opener, and it certainly sets the tone for the rest of the album. "Martyr No More" comes next, and it is followed by "Grail," which is one of my absolute favorite tracks from this record. Jericho wrote some great lyrics for this one. The line "You can cast the magic spell or pull the sword from the stone" evokes the memories of some classic songs by written by Ronnie James Dio. "Grail" features a powerful, but still catchy as Hell, chorus. I find myself singing this song a lot. The music and vocals do a wonderful job of painting the picture of searching and longing that the lyrics suggest. The more laid-back side of Fozzy really shows in the song "Broken Soul." It feels deep, yet optimistic. The first time I heard it, I thought, "This is a total lighter moment!" I really sense a Beatles vibe during the bridge. This track offers a nice change of pace, breaking up the heavier songs and making it all more interesting. "Let the Madness Begin," which was available as sort of a sneak-peek on Fozzy's website, is another one of my favorites from Chasing the Grail. It sounds very new and exciting, but I also hear a lot of Ozzy Osbourne influence in it. The title conveys the message, and lyrics are great. The liner notes say guitarist Rich Ward contributed the line "The devil feeds on my thoughts, even when I pray." This line adds so much to Jericho's already fantastic lyrics, and I can really tell that this songwriting team works so well together. The next track, "Pray for Blood," is a very heavy song that features some outstanding guitar work and lyrics that tell an exciting and violent story. I could really bang my head all day to what Jericho calls a "song about 10th Century Vikings who would eat their enemy's hearts after killing them." The opening lines are one of my favorite parts of this song. I honestly think Jericho should really take advantage of this track and use it as new ring entrance music. This song would be AWESOME entrance music! I've been thinking that since the first time I heard it. "A New Day's Dawn" is one of the most interesting songs from Chasing the Grail. It is fascinating in that it begins with some falsetto vocals by Rich Ward. The lyrics of this song are quite memorable, especially because of the rhyme scheme. Also, I'm flat-out impressed by the use of the phrase "jumped the shark." There are some elements of this song that remind me of the Finnish rock band H.I.M. I'm not sure if it's the overall tone of the song, or if it's just the way it flows. My most favorite song on this album is "God Pounds His Nails." I get so unbelievably pumped each time I hear this song! It is incredibly powerful. It is so much fun, but it's profound due to the religious imagery in the lyrics. The "hey... hey... hey" and the "one... two... three" in the energetic chorus really makes me want to hear this song live. This song is meant to be heard while in a crowd of metal heads. I'm not going to lie... The song "Watch Me Shine" gets me choked up. I find this song to be very deep. I think it accurately summarizes the ongoing ills of the world. I think the chorus is great, especially the lines "I don't want to live without her, even though at times I've lost my mind." That part is so beautifully written it gives me chills! "Paraskavedekatriaphobia (Friday the 13th)" is a hard and heavy bone-shattering track that has Iron Maiden influence written all over it. The speed of the drums and guitar riffs in this song reminds me of the speaker vibrations at the Machinehead/Megadeth show I went to last November. I really like the superstitious and mysterious content of the lyrics... very METAL! I don't even know how to begin to describe the album's grand finale, "Wormwood." I try very hard not to ever overuse the word "epic." But until I can come up with something better, I have to stick with that. To put it simply, "Wormwood" is a 14-minute multi-part masterpiece about the Apocalypse written by guitarist Mike Martin and Chris Jericho. Listeners everywhere have been impressed by it since day one of Chasing the Grail's release, and the track has been heavily praised on Twitter. "Wormwood" consists of six different movements, all with different titles such as "The Seven Thunders" and "The Seven Seals." It opens with some whispering (which sounds like Latin if I'm not mistaken) and the Biblical verse Revelation 8:10-11. Following that is a beautiful acoustic guitar solo. Then comes the roaring electric guitar. The first part of Chris's vocals are creepily whispered, then they get progressively more powerful. Each piece of the song flows together perfectly, and a choir and other instrumentation magically fit. This song is Fozzy's deepest and darkest song to date, and it is extremely unique and utterly magnificent. There is so much more to say about "Wormwood," but I will leave it at that so I don't spoil it for those who haven't heard it yet. After listening to Chasing the Grail for four days now, I can sincerely say that I would rank it among my most favorite rock and metal albums. I really can't get enough of it. Each time I listen to it--whether it be while driving to work, exercising, or just relaxing--I discover a new reason to enjoy it. Each song from Chasing the Grail is something amazing and different, and its final masterpiece "Wormwood" is the icing on the already outstanding cake. This is the best new album I've heard in ages, and it is truly the best one I have written about since the inception The Rock Maiden website. Go out and buy a copy right now, and if you can't wait, get it from iTunes. 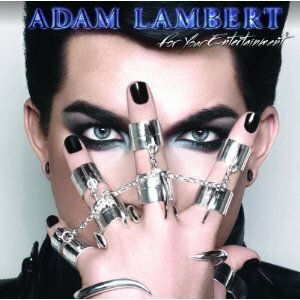 Before Adam Lambert's debut album For Your Entertainment hit retailer shelves and iTunes, AdamOffical.com took pre-orders for a "special fan edition" of the CD. It included a collectible hardcover photo booklet and bonus song downloads--"For Your Entertainment" and the non-album tracks "Down the Rabbit Hole" and "Master Plan." The latter songs are currently available on iTunes, and they are not "album only." I have a question for Adam's record company and the album's producers: Why weren't "Down the Rabbit Hole" and "Master Plan" on the album's final cut? Actually, I have another question if I'm allowed to ask: Were they even considered? The songs are great. I think both of them are much better than a couple of the songs that did make the final cut. I'm not sure which bonus track I like better, because they each have their high points. I know I compare a bit too much, but I must say, "Down the Rabbit Hole" (as a friend of mine from Twitter put it) is highly reminiscent of "Pretty Vegas" from the J.D. Fortune-era INXS album Switch. Lyrically and style-wise it really reminds me of the song "Devil's Party" from the same album. On a side note, J.D. Fortune was an Elvis impersonator, and many people have said Adam has a 21-st century Elvis vibe. "Down the Rabbit Hole" is electronic, danceable club fare. I absolutely love the references to Alice in Wonderland and the use of the phrase "stripper shoes." The other bonus track "Master Plan" has a VERY catchy chorus and a cool beat. It has an empowering and anthemic feel just like "Strut." But by no means are they the same song. I think "Master Plan" is a bit deeper and more observant. I feel like my assessment of For Your Entertainment is more complete now that I have reviewed the bonus tracks. I think these bonus tracks help fans and critics alike see even more facets of Adam Lambert's style and talent. I am definitely not bored with For Your Entertainment, but I am already looking forward to another release from Adam Lambert. Like a commenter on the previous review said, I am just looking forward to something that is a little less produced and a little less techno sounding. Don't get me wrong, I'm not one of those people who hates ALL electronic music. I own all of the Queer as Folk soundtracks, which are heavily electronic. I also love most '80s New Wave and synthpop. I just think Adam Lambert's voice is entirely too good to be messed around with, and it does not deserve to be over-produced.